The only nice thing about having our poor little urban garden decimated by our builders was that I was able to start again, planting a completely toddler-friendly garden from scratch without feeling bad about rooting up existing plants (because the builders had killed them all). But one of the problems with that is that it means that I am stuck with a load of raised beds, flowerpots and planters that are filled with soil that’s got nothing growing in it and isn’t being held together by roots. To avoid the proliferation of weeds and the soil drying out, I’ve decided to sow a brief cover crop of spinach in one bed. I have planted some in my bottom wall planters and so thought it might be a good idea to do so in the main beds too. I thought I’d try out a seed tape as I haven’t tried them before. It was slightly ridged and so I’m worried that it might have gotten damp at some point and to be honest it felt a bit like cheating to use a tape. 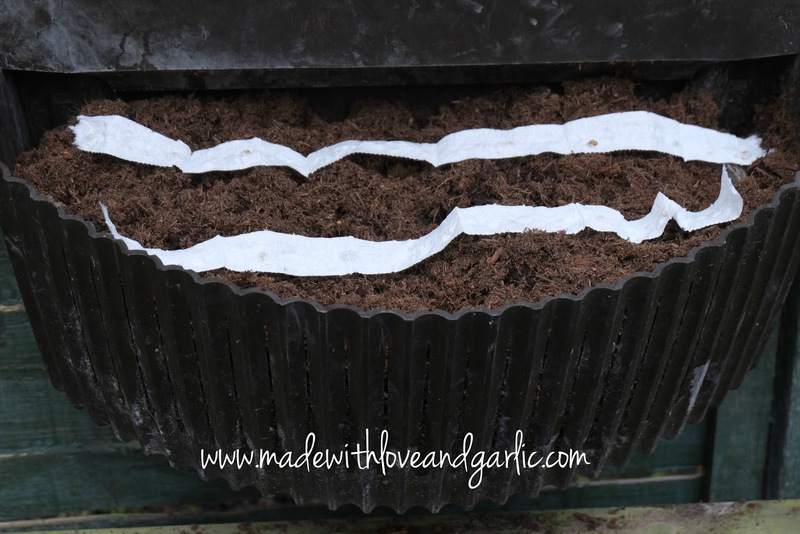 It also felt a bit like burying loo roll rather than sowing seeds so I’m not at all convinced that it’ll grow but we’ll see. The pepper and tomato plugs that I’ve ordered to go in this bed won’t arrive until May so hopefully we’ll have a decent in-between crop of spinach before then.